Beautifully engraved certificate from the Naugatuck Water Company issued in 1889. This historic document was printed by the Kellogg & Bulkeley Company and has an ornate border around it with a gold gilded underprint showing the bond's $500 denomination. This item is hand signed by the Company’s President ( Homer Twitchell ) and Treasurer ( S. S. Scott ) and is over 119 years old. The certificate is also signed by Meigs H. Whaples as President of the Connecticut Trust & Safe Deposit company who was the Trustee of the Bond. In 1915, the New Naugatuck Reservoir was built on Hill Brook by the Naugatuck Water Company. It was first called the Long Hill Dam. 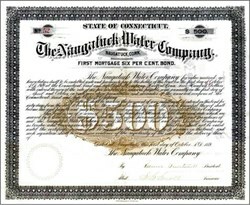 The the Naugatuck Water Company was subsequestly acquired by the Connecticut Water Company. Homer Twitchell. Born on 19 Aug 1826 in Oxford, CT.26 Homer died in Naugatuck, CT on 18 Mar 1904; he was 77. Homer was chosen as a District delegate to the Democratic State Convention in 1884. The certificate is signed on the verso by M. A. Whipple as Trustee for the Connecticut Trust and Safe Deposit Company. This is the first time we have seen this bond. Meigs H. Whaples was born in New Britain, Connecticut on July 16, 1845. He was educated in the public and high schools of his native town, afterward attending the Commercial Collegiate Institute at Poughkeepsie, N.Y., graduating in 1862. Soon after he entered the employee of the New Britain National bank on the same day with now ex-Governor Chamberlain, then a resident of New Britain, Mr. Whaples was appointed teller in 1863, and later accepted a similar position in the Mercantile National bank of Hartford, which he acceptably filled until 1869, when he retired to enter the United States navy, being appointed on the staff of Admiral Oliver Glisson, and later serving on the staff of Admiral C.S. Boggs. On the expiration of this term of enlistment he returned to civil life, and later became adjutant of the First Regiment, C.N.G. In 1872 he accepted a position with the Connecticut Trust & Safe Deposit Company , and in 1878 was elected its president, which position he now fills, and without doubt to the satisfaction of every member of the company, the office force and all reasonable patrons of the institution, for never a word is hear spoken of Meigs H. Whaples only in commendation of his good qualities as a man and citizen -- his unfailing kindness of heart, warmth of greeting, democratic spirit and steadfast devotion to all that makes for a more exhalted manhood, a higher and nobler civilization. Mr. Whaples is a director of the Board of Trade, a trustee of the Scottish Union and National Fire Insurance company, a director of the Hartford Fire Insurance company, a trustee of the Society for Savings, treasurer of the Connecticut River and Highway District Commission, secretary and treasurer of the Collins Company of Collinsville, vice-president of the Pickering Governor company of Portland, and a director of the Stanley Rule and Level company of New Britain. He is also president of the Hartford Gold club. In religion Mr. Whaples is a Congregationalist and in politics an independent Republican. He has served many years as a member of the Board of Police Commissioners, and at present is a member of the Finance Committee of the city of Hartford, a newly created office. His fraternal connection is with the Masonic fraternity. Mr. Whaples is a benedict, his wife's name prior to marriage being Miss Harriet Atwater Hotchkiss. There are two children in the family. Patriotism and courage should be added to his other enumerated good qualities. His service in the navy is among his most cherished memories of the past, and there are few things he more enjoys than reminiscences of the old days afloat. He is now an honorary member of the Second Division, Naval Battalion, and always to be found as one of the most interesting of the speakers at the board of annual banquets. There are many citizens of the capital city of the state, regardless of present party affiliations, that would mush like to see Meigs H. Whaples once enthroned in the gubernatorial chair beneath the gilded done, and no partisan fetters could be strong enough to hold them from active service toward such a consummation.